Sorry, I have been neglecting the Flog. Wedding planning takes a lot of time and energy. Part of me thinks it would be interesting to start a second blog documenting the trials and tribulations of trying to pull off a 150+ person event on a budget, but that might not be a great idea. Okay, back to the food. Two years ago, I visited Gene’s Chinese Flatbread Café when it was in Chelmsford. I was not impressed by the flatbreads, but enjoyed the hand pulled noodles, however not enough to make a special trip to Chelmsford. Now, there is a location in downtown Boston and in Woburn center, which is far more convenient to my travels. The space is larger and has cheerful yellow walls. 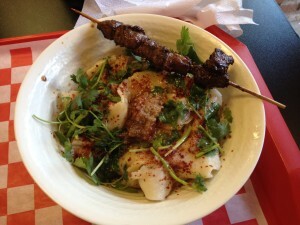 I got the hand pulled noodles again ($6) and a lamb skewer ($1.5). The noodles are still delicious and toothsome, doused in chili oil, minced garlic and cilantro. I loved the cumin flavor of the tender lamb, although the serving is a little small for the price. They offer chilled noodles only on the weekends and that might be worth a special trip. The food is hearty, unique and affordable. I hope the people of Woburn are open minded enough to embrace this gem.